First of all, there are two dollar design types that were minted in 1921. A Morgan type, similar to the dollar that was discontinued in 1904 and a new type called the Peace Dollar that was essentially a World War I commemorative. The easiest way to describe the difference is that the eagle has closed wings on the Peace Dollar and open wings on the Morgan. The 1921 Morgan is the most common of all U.S. silver dollars and is available in quantity even in uncirculated condition. There were no special coins sold or made or packaged for collectors in 1921 except for some specially engraved presentation pieces made at the Denver Mint with the words DOLLAR RELEASED FROM THE 1ST 100 EVER COINED AT DENVER MINT THOMAS ANNEAR, SUPT. Only a small number of 1921 proof Peace dollars were minted and those are very rare and valuable. The regular issues are scarce and have a higher premium than the 1921 Morgan but there is no record of these coins being packaged by the Mint for collectors either. Jack P. writes: The nickel in my sealed 1975 proof set has normal obverse, but the reverse is a flat dark grey with dark grey with slight brightness around 40% of the very edge. On the center, Monticello almost appears to have some coppery redness in the grey. I had sent the set to Tom DeLorey at Coin World in March of 1976 and he advised me not to break open the set. Any ideas? Nickels are made of an alloy of 75% copper and 25% nickel. When the planchets (coin blanks) are made, sometimes the alloy isn’t mixed correctly. It wouldn’t be impossible for some of the copper to have come to the surface as the metal mixture cooled. This problem occurred quite often on U.S. gold coins. Copper and gold alloy are even harder to uniformly mix so that the copper color is hidden (U.S. gold coins after 1834 are 10% copper). The grey toning you mention is oxidation caused by contact with some chemical agent. The 1975 sets are not very well sealed allowing air and other pollutants to come in contact with the proof surfaces of the coins. What is the name of the buffalo on the nickel? Bob H. writes: What is the name of the buffalo on the nickel? Ah, you’ve come to the right place for that question! Buffalo nickels are a favorite of mine. I always thought that James Earle Fraser’s design had class even though it might not be thought of as being “politically correct” today. I like to think that it is our first coinage tribute to Native Americans. The indian on the obverse is really a composite portrait of three indians, Iron Tail, the famous indian that beat the pants and scalp off of General Custer at Little Big Horn, Two Moons and Chief John Tree. And oh yes, the buffalo, actually really a bison, was named Black Diamond and he didn’t get to thunder around much since he was a resident of the Bronx Zoo in New York. Janet writes: I have a buffalo nickel from 1936, do you know how much it is worth? If I had a nickel for every time some one asked that question I’d be……loaded down with nickels. Actually, the 1936 Buffalo nickel is one of the most common in the series. It was also a date that was very near the end of the life of the design (1938 was the last year). People tend to hoard the last few years and the first year of a coin’s run. You didn’t tell me if your 1936 Buffalo nickel had a mint mark, (S=San Francisco, D=Denver No mint mark=Philadelphia) or what grade the coin was in. 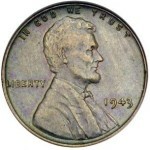 If it is average circulated its worth about 25 cents or a bit more. If it is in new condition any one of the 1936 issues would be worth at least $15 and a lot more if the coin was a superb specimen. There is a valuable but elusive variety of the 1936-D Buffalo Nickel that has only 3 1/2 legs. This is certainly the result of late die state or in layman’s terms, the die was way past its useful life. If you find this variety, even an average piece would bring $300. Another letter about 1934 notes comes from Paige M: I found a five dollar bill from 1934 which is quite different from today’s five dollar bill. Is it worth anything? 1934 $5 notes come both in Silver Certificates with blue seal and Federal Reserve Notes with green seals. 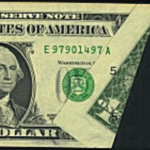 The blue seal notes are no longer made and would certainly be recognizable as different. The FRN notes come in both a light and dark green on the seal. The light green seal is worth a bit more. If the note is in new condition it would bring at least $15. There are also various series letters and in the case of the FR notes which of the 12 Federal Reserve banks issued it. I have a 1934-A ten dollar bill (not stamped nor is it a silver/gold certificate) is it worth anything? I assume when you say that the note isn’t “stamped” that it is missing the third printing, that is, the Treasury Seal and serial numbers. 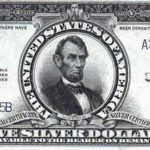 The type of bill would still be readily recognizable by the words on the top “Federal Reserve Note” or “Silver Certificate”. There wouldn’t be 1934 series gold certificates as they were outlawed in 1933. Notes without Treasury Seal and numbers would bring a significant premium as there is a good collector base for error currency. The condition is very important as these error notes are usually collected in near uncirculated to gem uncirculated condition. If it makes the “grade” it would bring $100 or more. 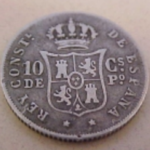 Ramon L. writes: While studying in Israel, I purchased a 1842 Seated liberty silver dollar at a small antique dealer store . 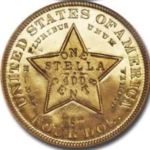 The mint mark “cc” appears on the reverse, under the eagle. I have searched to verify the authenticity of the coin, but I am informed no coins were issued with this mint mark in 1842. Could this be an “error” coin? Thank you for the the anticipated assistance. Unfortunately, your coin is a counterfeit. It is one of the many phony U.S. coins that have appeared in the coin market over the last several decades – the majority reportedly coming from Asia. Like yours, we’ve seen many with impossible date/mintmark combinations. The Carson City Mint wasn’t constructed until 1866 and no dollar coins were struck there before 1870, which would eliminate the possibility of your coin being minted there in 1842. In addition, the motto “In God We Trust” was not added to U.S. dollars until 1866. To the experienced eye, the coin just has the wrong “look.” Note the poor quality of strike and details on the counterfeit piece. 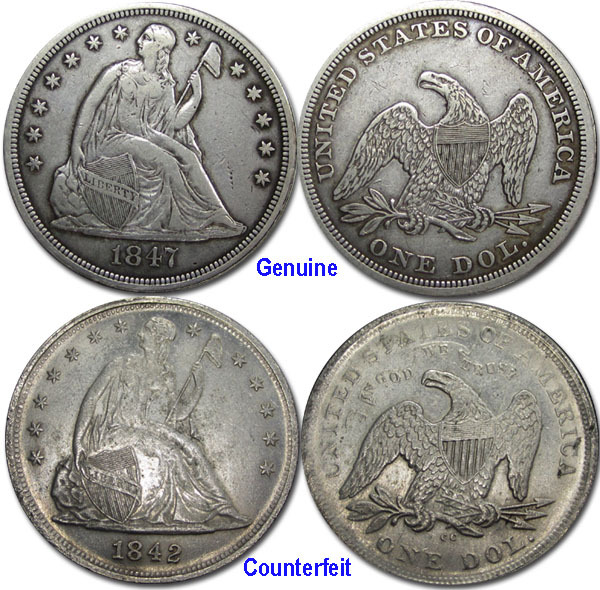 Closer examination reveals that the counterfeit coin is both underweight and the surface appearance seems closer to that of an aluminum/silver alloy? rather than an authentic 90% silver coin. Counterfeit U.S. coins from Asia have been around for years, and many were brought home from Vietnam by returning servicemen. More recently, particularly since the U.S. involvement in Afghanistan and Iraq, they have been appearing with more frequency in the Middle East. One source told us they were being offered to U.S. airmen outside the gate at the U.S. air base at Kandahar.